A Priest, an Economist and An Occupier Went into a Bar…. What do a 15th century priest, a deceased British economist, and the Occupy Wall Street Movement have in common? This question came to me as I reflected on a sermon by Chris Hershberger Esh this past Sunday at West Philadelphia Mennonite Fellowship (WPMF). Using passages from Ezekiel 34 and Matthew 25 as his texts, Chris spoke about the significance of Occupy Wall Street, and its local affiliate, Occupy Philly, for Christians concerned about social justice. The two Biblical passages mentioned above both reflect a concern about the rich and the poor, and the powerful and the powerless in society, and unequivocally show that God is on the side of the poor, the powerless and the oppressed. Chris contended, rightly I think, that the Occupy Wall Street movement had accomplished two things in its short-lived two month existence. First, the movement has changed the national conversation about the economy from talking about bringing down the debt to talking about the vast and gross inequities of wealth in this country, and indeed around the world. With its now familiar refrain “we are the 99%,” the movement has caused political leaders, as well as ordinary citizens, to consider why it is so many people are experiencing not only a loss of jobs, but a loss of real income, while an extremely small minority, the 1%, have experienced the greatest rise in wealth in recent history. The Occupy Movement has forced us to ask what is it about an economic system that lavishly rewards the few at the expense of the many. However, it was the second point Chris made that has prompted this reflection. Responding to the ongoing question in the media, “What do the Occupiers want?” Chris said that there is no simple solution that will cause the occupiers to pack up their tents and go home. 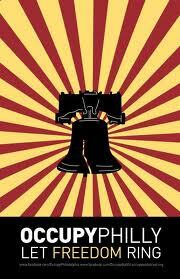 Referring to the Occupy encampment on Dilworth plaza surrounding Philadelphia’s City Hall, Chris shared how the occupiers have welcomed homeless people to join their encampment and have provided them with support, food and solidarity in a way that they can’t find in a shelter. Chris himself works as an outreach worker for a local homeless shelter, and has said that the numbers in their shelter are down because so many of their normal clients have chosen to join the occupiers rather than come in the shelter. He pointed out that in their encampments the occupiers are seeking to model the kind of society they envision, a society where the haves and have-nots can reside together in community. Furthermore, the Occupy movement has given the homeless a platform and a voice to demonstrate that the society must also listen to them in their struggle for survival. Such an arrangement is not easy to maintain, given the fact that many homeless people suffer other psychic wounds such as addiction, mental illness and personal trauma. Further, as a recent John Stewart report on the occupiers at New York’s Zucotti Park showed, even among the occupiers normal resentments and even class distinctions have developed. However, instead of ignoring or rationalizing these issues, the occupiers have sought to welcome all as fellow human beings worthy of dignity as well provision for their basic human needs. All of this brings me to the 15th century priest and the British economist. Menno Simons, from whom the Mennonite church takes its name, was a Roman Catholic priest who came in contact with a splinter group of Christians known as the Anabaptists. Menno became convinced of the power of their claims and ended up being one of their most prolific spokesmen and writers. One of the many distinctive insights that the Anabaptists have offered the Christian church has been the notion that when Jesus talked about the Reign (or Kingdom) of God being among us, he wasn’t talking about some far off pie-in-the-sky promise to keep desperate people focused on heaven so they wouldn’t think about their despicable living conditions. Anabaptists, including Menno, believed that Jesus was talking about the power of God to change human reality now, and that as Christians we are called to live as much as possible according to the dictates of Jesus, particularly those dictates outlined in Jesus’ Sermon on the Mount (Matthew 5-7). We are to live now as God desire all people to live in heaven. We are to live out the challenge embedded in the Lord ’s Prayer to follow God’s will “on earth as it is in heaven.” As I listened to Chris describe how the Occupy Wall Street movement was seeking to model the kind of society they envision, I could not help but think of this central Anabaptist conviction. While not in any way a religious or spiritual movement, the Occupy Wall Street movement is calling all of us, and especially people of faith, to consider that God may calling us to a new level of awareness and commitment to live out the values of God’s reign here and now. In a different time and place, the British economist E.F. Schumacher wrote a simple but profound book in 1973 entitled Small is Beautiful: Economics as if People Mattered. Schumacher demonstrates how macroeconomic thinking with its focus on quantitative measures, such as GNP, GDP and corporate bottom lines, tells only a portion of the story of a community’s or a nation’s economic health. As he points out, just because a nation may be cumulatively wealthy on paper, that does not mean that said wealth is equitably distributed or enjoyed by all members of that community or nation. Schumacher argues that economists need also to consider qualitative measures of economic health, such as environmental health, the quality of community relationships and the appropriate use of technology, thereby paying attention to indicators that measure quality of life rather than simply a cumulative number. Schumacher also persuasively argued for a regional and local approach to economic development that takes into account skills, needs, and resources that are locally available. He argues not only for a more de-centralized distribution of economic power, but also a more environmentally friendly approach to economic activity. In a time (the 1970’s) when the raging economic debate was between capitalism vs. communism, Schumacher argued for a third way of economics, which today is still kept alive by the New Economics Institute, which regularly presents living models of Schumacher’s third way of economic thinking. Were he alive today Schumacher would point to the Occupy Wall Street decentralized democratic decision-making as a model of equitable and compassionate living. Bill Moyer (not be confused with Bill Moyers, the NPR journalist), a longtime community activist and author on the nature of social movements, noted that often the ideas that spark social movements lie in seed form for years before they emerge in a full-fledged social movement agenda. In many ways the Occupy Wall St. Movement is the culmination of struggle, emotions, and seminal ideas that have been around for a long time. 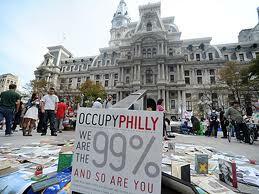 While politicians and media types like to characterize the Occupy movement as a the result of angry radicals who are just a momentary phenomenon, in reality it is an expression of many ideas and concerns that have existed in various forms for a long time. Whether or not Occupy Wall Street survives the latest series of attempts to remove them from public spaces, the hopes, dreams and ideas it expresses continue to gain momentum and take shape because they give voice to thoughts, concerns and frustrations that have been around for decades if not centuries. Thanks for sharing your thoughts, Drick.